Contemplate (make muraqaba) that I love Allah and Allah also loves me. This muraqaba is extremely beneficial. 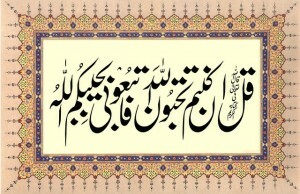 When an individual afflicted with extremes of worries and anxieties does this muraqaba, all of them vanish completely. This is because there is conviction that Allah loves me and therefore there must be some benefit for me in this affliction. In love, who will hurt the loved one? This entry was posted in B. Praise worthy morals, E. States, F. Zikir & fikr, H. Whispering & random thoughts, Uncategorized, W. Wird & wazaif, Z. Mustahebbat on February 24, 2013 by 'abd.